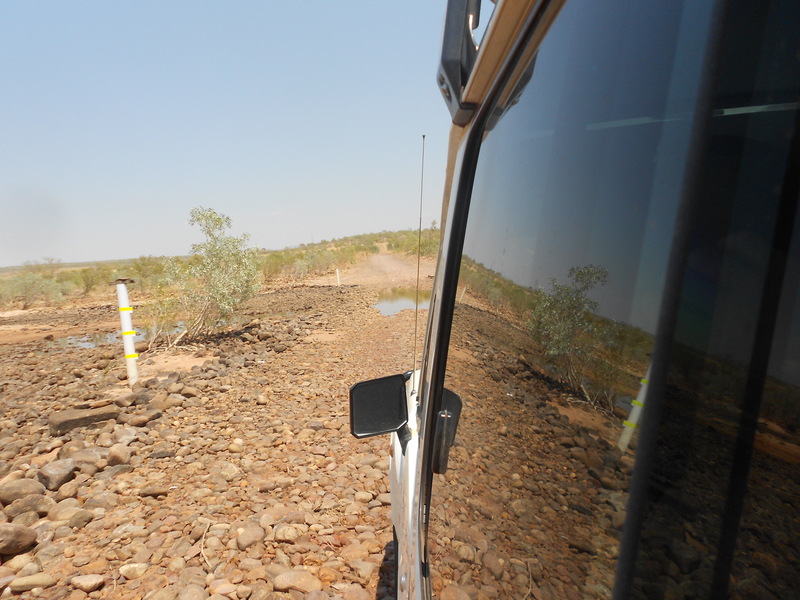 The Gibb River road, heart of the Kimberley in Australia, used to be a route to get cattle to the ports of Wyndham and Derby. Now it is an adventurous road that leads tourists into the wilderness. You can attempt to do it in your own car, 4×4 required, or you can choose one of the many tour operators, from cruises to small group road tours. As I don’t own a car and couldn’t find travel mates that were up for the challenge, I decided on a tour. Kimberley adventure tours offers rugged tours with lots of camping and hiking. So I went back to basics. After seeing the beauty of Edith Falls in Nitmiluk, camping on an island on the magnificent Lake Argyle and seeing Purnululu national park, we entered the Gibb. 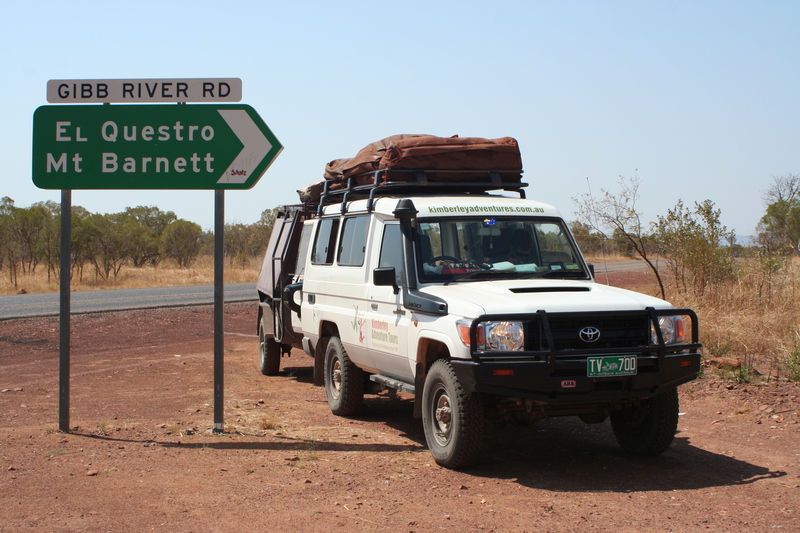 It started with an easy sealed road until the turnoff to El Questro. El Questro offered a luxurious camp ground to return to after your walks. I mean, the place had showers and grass! El Questro offers many walks, of which we chose two. 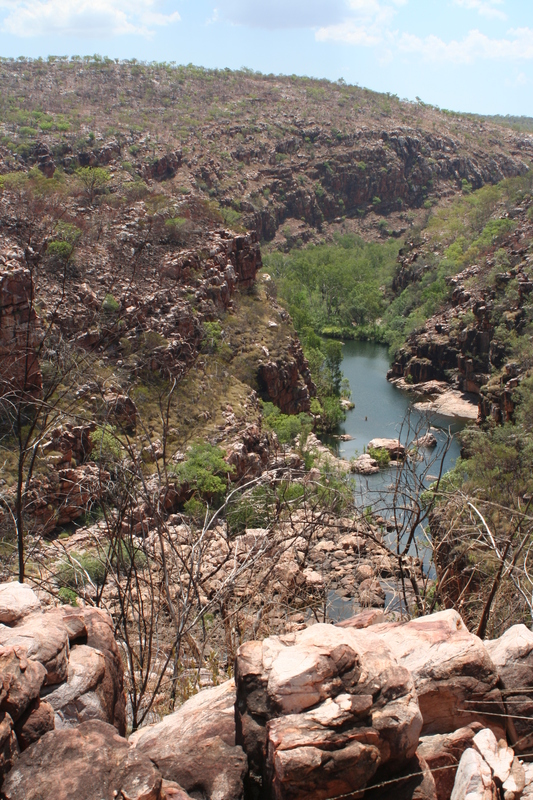 The first one led us into El Questro gorge, a narrow gorge filled with rocks. The walk into the gorge is a challenging one as you have to quickly acquire some climbing skills and wade through water. To add a bit of excitement our group started a little late and ended up going back as night fell. The two torches we had paved the path for our return. 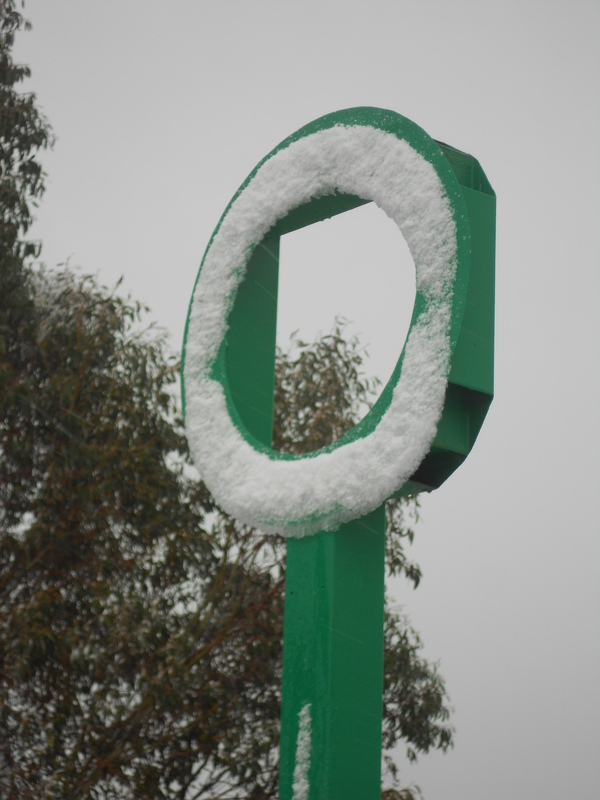 The next day we were treated with the Zebedee hot springs. It is a little paradise hidden between the trees, all natural, no pavement or tiles. Considering it was a bit hot that day we didn’t stay long and made our way to Emma gorge, apparently the place of many a heart attack. The walk was hot since it was only partly shaded. It wasn’t strenuous, but you had to look where you placed your feet since the path had many rocks on it. At the end waited the real treat, a big swimming hole with waterfall. Unfortunately the way back made us yet again sweaty and hot. And then the big drive started. The road started changing all the time, red dirt, purple-red, grey, sometimes even sealed for a small distance. Along the way we saw rock art, a swimming hole and got a flat tire. The vistas for the lookouts were stunning. We didn’t see very many other cars, but were always greeted by cows, as our driver and guide Rick drove honking to get them off the road. There had been many bushfires during the dry and the landscape looked charred and black, but the new leaves and branches had already started growing. An adventure awaited us in Manning Gorge. Everything was prepared for the wet, so instead of taking a little boat across the water to start our walk, we had to wade through it. It was hot enough anyway. The walk led us to a waterfall of which we only saw the grey it had left behind on the rocks. The water had totally dried up. Luckily there was still enough river to go through. 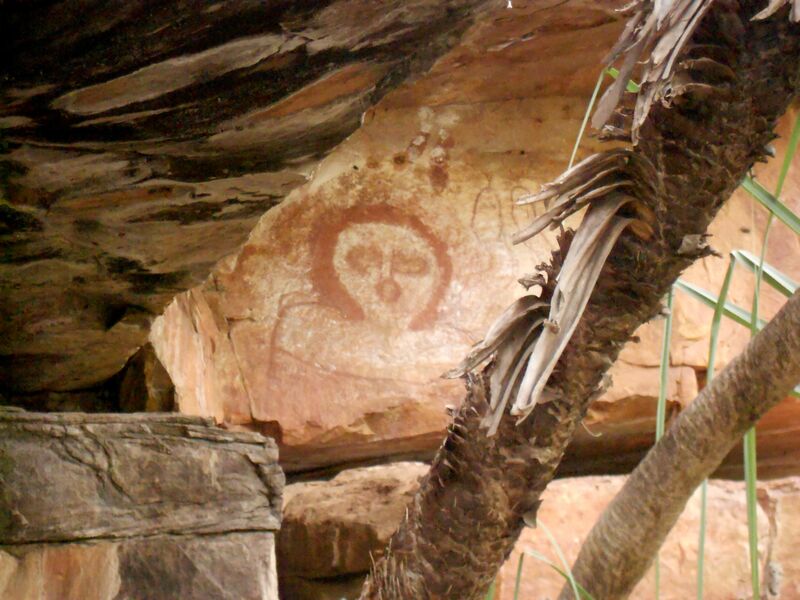 The next part of our adventure was a swim and light canyoning, occasionally stopping for rock art and muesli bars. It was a team sport as not everyone was a strong swimmer. In the last part there was the option to walk instead of swim. One of the guys gave it a try. He didn’t make it very far. He pissed off a bull, which came running at us. I’ve never jumped into the water that quickly! At our bush camp for the night we heard the kookaburra’s call, like a monkey in the night. From our camp we could walk to the beautiful Adcock gorge, where we rested in the shade and enjoyed looking at the wildlife. 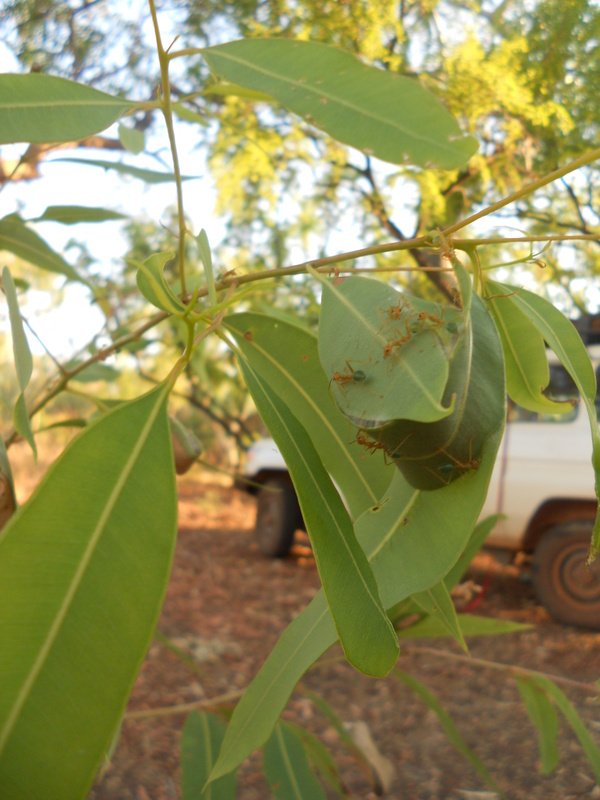 Well, some of it… The Kimberley is home to the nastiest ant I’ve ever encountered; the green tree ant. They live in certain trees and if you accidentally come too close to their nests they jump on you like you’re a delicacy they’d love to bite. Bell gorge was also a treat to see. Of course we didn’t just see the gorge but extended the hike off the normal tracks and deeper into the gorge where we had a waterhole all to ourselves. Rain and thunder spoilt the fun, but walking in that was preferable to the heat we had on our way in. It was a difficult hike with some climbing, but in the end it was totally worth it. There was one more camp in the Kimberley. The wind was raging and kept me awake for a while. In the morning it had died down. From my swag I saw the sunrise. 5 o’clock, time to get up. At the very end of the Gibb River road two more surprises awaited us. 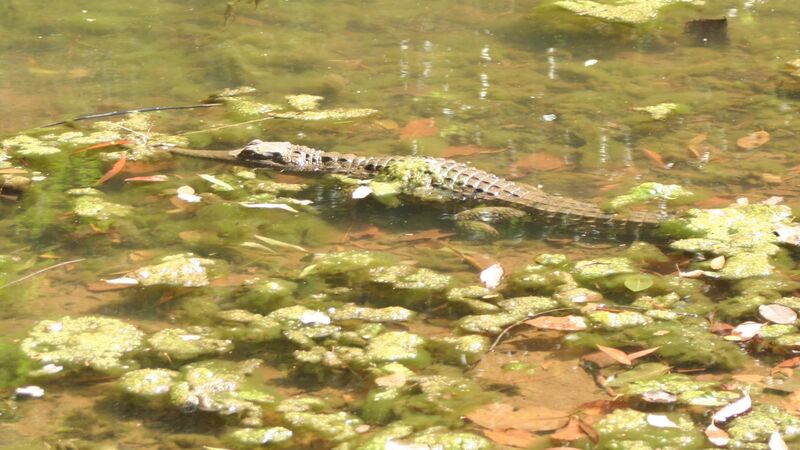 In Windjana gorge we could see dozens of freshwater crocodiles. The freshies were just chilling in the river while we were walking on the sand, only meters away. They’ll generally not harm you, unless you ask for it. Fruitbats were flying all around the red walls of the gorge from one tree to another. Part of the same area was Tunnel Creek, a cave you could walk through if you were prepared to get wet feet. This time we carried plenty of torches and wandered through the area where over a hundred years ago a freedom fighter hid himself for 4 years. There were traces of crocodiles, yet we didn’t see any. O well, who’s worrying about the crocs where there are bulls around? It was a trip never to be forgotten. Sleeping underneath the stars, being outdoors, cooking on the campfire and good people all around. I’d go back anytime. The whole reason I started writing blog posts started years ago, with my trip to South Africa. I would be away for half a year, closely followed by another half-year in Finland. Since I like writing and in order to keep my family up to speed on what was happening in my life I created a blog. For my other blog, travel writing is till the main purpose. For that reason, the strangest location in which I’ve written a post might just be my home! My strangest post is definitely the one I wrote at the airport. I’d just landed in Amsterdam and only one of my friends even knew I’d been flying in the last 48 hours. Instead of rushing to the luggage belts I couldn’t wait to get out my laptop and connect to the internet. I had to let people know I was home. I still had two hours to go until I would be at my parents’ house. Two hours in which I knew that if they would look into their email account, they would know. They didn’t. My coming home was a total surprise. Other people did find out via my blog and I got some confused emails and text messages from my friends. There is no better way to come home! So many plans. So many wishes. So many questions. So many places. Being a traveller isn’t easy. There is just too much to do! I am planning my next trip, which starts in two days actually. The first part is done. I am flying to Darwin, where I will stay for three nights until my organised tour starts. 6AM sharp I will be waiting for the group to embark on an adventure. Nine days of getting up at stupid o’clock, sleeping under the stars, hiking and bumping and shaking over the 4WD tracks of the rugged Kimberley. But then I arrive in Broome and the real question starts: how far can my money get me? The budget is, just that: a tiny budget. As I don’t have a car I rely on finding others to travel with. Hopefully with a van or some camping equipment. Scrap those budgets found on the internet. Even in Australia you can live on a budget. Yes, a meal in a restaurant sets you back 20 dollars, but what about cooking? So I set my daily food budget on a generous 18 dollars a day. But really; I hope I don’t spend it. From Broome I want to make my way to Perth to explore the city, and then eventually make my way back to Adelaide, where my boyfriend will be waiting for me. I plan on doing this in five weeks, but will I find people to travel with? Will they have the same plans and interests as I have? The ‘wills’ and ‘what ifs’ have taken over my mind. It’s a mystery and it freaks me out just a little. For a person who has always got things planned and prepared this is a true adventure. So yes, I have a list. A true wish list this time. It includes all the things I’d like to do and see along these 5000 kilometers. It includes just as many question marks, for I do not know if my trip will take me there. So bring it on! A true Ozzie road trip. Off to adventure I go. Checking one thing at a time. Best case scenario: thousands of photographs, dozens of new friends and a checklist with crossed-out words. Worst case scenario: thousands of photographs, dozens of new friends and an empty bank account. Well, such is life. I’d like to say I’d go somewhere super adventurous, like living with some distant tribe that doesn’t use mobile phones. If something like that even exists these days. But honestly, could I do that? I don’t think I have the guts to see something too different. Would I eat what they eat? Sleep like they sleep? Dress as they dress? Could I say goodbye to all my comforts? Honestly, I don’t think I could. But if it isn’t going back to basics, then where would I like to go? I’ve got dozens of travel magazines that inspire me with rich stories and pictures. And yet when asked this question, I don’t have an answer ready. When I was younger I wanted to do an exchange in America, but I guess now I would go for something a bit less western. Something that might cause a bit of a culture shock. Maybe it would be cool to experience the Arab world. Especially since I don’t know much about it. I’d like to be part of a family in Jordan. Surprise me! I’m sure I would like it and I’d learn a lot. But the thing I am most sure about is that I’d be happy to live my own life again after that.